With all of the components of a riveting murder-mystery, including a baffling disappearance, a set of gossipy characters, a love triangle, conflicting evidence, and a scandalous trial, A Tale of Two Murders: Passion and Power in Seventeenth-Century France by James R. Farr is a fascinating read. Farr chronicles the investigation and subsequent trial of Philippe Giroux, a wealthy nobleman in Dijon. The trial enthralled Dijon’s inhabitants and the whole of French noble society from 1639 to 1642. In the growing city of Dijon, France on September 6, 1638 Pierre Baillet and his valet, La Valeur went missing. Immediately after learning of the men’s disappearance, maidservants, apprentices, shopkeepers, and other workers began to gossip in the streets about what had happened to Baillet and La Valeur. Some argued Baillet simply left town unexpectedly while others spread more sinister rumors of foul play and murder. After six months of petty gossip a formal investigation finally began. Soon Jean-Baptiste Lantin, the investigation’s leader, found a primary suspect: Philippe Giroux, Baillet’s first cousin. As a président of the Burgundy Parlement, Giroux was a powerful and prominent member of society. However, when it became known that Giroux was involved in a passionate and secret affair with Baillet’s beautiful wife, Marie Fyot, and that Baillet and La Valeur had dined at Giroux’s house on the night of their disappearance, Giroux became the focus of Lantin’s investigation. News of Giroux’s arrest sent shockwaves through the community, creating another firestorm of gossip and speculation that greatly influenced the course of the subsequent trial. In addition to providing a captivating narrative, A Tale of Two Murders investigates the ways in which power, justice, law, and society all intersected and, at times, conflicted with one another in seventeenth-century France. 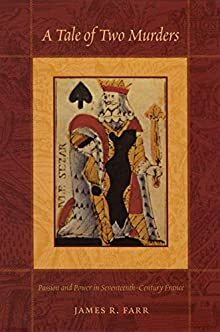 Farr shows the conflicts between the formal powers of the judicial system and the informal powers of the nobility’s patronage networks and sketches in the community’s role as both witness and arbitrator. Informal institutions were paramount in determining not only which cases went to trial, but also the outcomes of those trials. A defendant’s reputation, as determined by the community, was of utmost importance in establishing whether or not an individual was capable of committing a certain crime. The judicial system in early modern France was a complex institution that favored those at the top of society. Vast patronage networks protected the nobility, making it very difficult for people to bring accusations against the nobility in court. But these patronage networks were not indestructible as the community could work to destroy an individual’s reputation by spreading rumors and accusations of particularly heinous acts. A Tale of Two Murders produces a vivid illustration of the early modern French legal system, power dynamics, and society while providing the reader with a spellbinding story of mystery, gossip, love, lies, deceit, and murder. Readers who enjoy murder-mysteries will surely find Farr’s A Tale of Two Murders a captivating and informative read.